The appeal to overturn the planning decision and allow test drilling for gas in Llandow is now under way! …And boy do we really need your help with this one! To help fight our case, we will be instructing a barrister to represent us in the public inquiry. We feel that this is necessary to give us the best chance possible of stopping this happening in the Vale. Obviously, to do this we are now beginning to incur costs, which is where you can help! If you feel as strongly about this as we do, please donate £10 or whatever you can afford to our campaign by any of the means below. All eyes are on us. If we can get this stopped here, then it will set a precedent for other cases throughout the UK! Lets make history! We really appreciate any help you can give us. It is only by working together that we can stop this in our beautiful rural Vale! DON’T JUST SAY NO, SAY YES TO! Transition Cowbridge are fully behind thevalesaysno.com campaign to stop fracking in the Vale as we feel passionate about our local environment. However, we also appreciate that just saying no is not the way to make positive strides forward. So if you are keen to say yes to moving forward to a more a sustainable, resilient and positive community then please contact us to get involved in our projects. 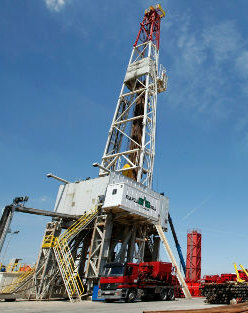 When Transition meets fracking, and wins. The story of Transitions Cowbridge and Llantwit. Here is a guest post from Michaela, Rob & Dinky of Transition Cowbridge, telling the story of their Transition initiative’s role in fighting a proposed gas fracking site. Thursday 20 October 2011 was a landmark day in the Vale of Glamorgan and one that will have a knock-on effect around the country and hopefully beyond. It was a day where community power helped to bring about a unanimous decision by the local county council to deny Coastal Oil & Gas the right to test for shale gas at an industrial estate on the outskirts of the village of Llandow. 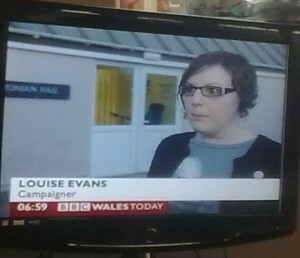 Louise Evans on the local BBC News. A few months prior to this, in February 2011, all that stood between the multi-billion dollar highly environmentally damaging fracking industry and a test drill being carried out in the Vale was one individual. Louise Evans runs a nearby caravan park and when she found out what was being planned she started researching the fracking process and raising awareness. Louise set up a web site and the ‘Vale Says No’ campaign was born. The local Transition towns, Transition Cowbridge and Transition Llantwit, have been active for the past three years. From the work already done we knew that there was a part of the community that did not need any convincing that something that had the potential to cause significant environmental damage, as well as keeping the focus on an unsustainable finite energy source, should be halted. However, as the wider community have not yet seen the light and moved to a more positive and resilient way of life, both Transition groups donned their awareness raising hats to focus their energies on supporting the Vale Says No campaign. The Vale Says No set up several public meetings to bring the issue of fracking and its consequences to the public’s attention. Both Transition groups used their existing networks to rally as many supporters as possible. This not only helped to generate a significant number of letters of objection, it was during one of these meetings that Coastal Oil & Gas was made aware that they had failed to consider a house only 200m away from the possible drilling site in their application. This resulted in them withdrawing their application and bought the campaign some much needed time to carry out research into the company and gather further evidence. As soon as Coastal Oil & Gas re-applied for planning, everyone was quick off the mark and Transition Cowbridge hosted a public meeting to a full house in the Town Hall. Word was spread via the website, the local press and by hand delivering invitations to local councillors, Welsh Assembly members and community organisations. 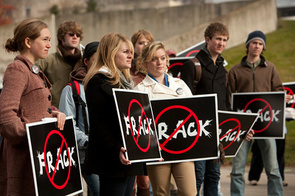 A large number of the people attending had not heard of fracking and alarm bells started ringing. This not only resulted in creating greater general awareness but it also helped to bring some key community members together who would go on to directly support the campaign. In addition to this Transition Llantwit hosted a viewing of the feature length documentary Gasland which highlighted to all the significant impacts that could result if fracking was allowed to take place. 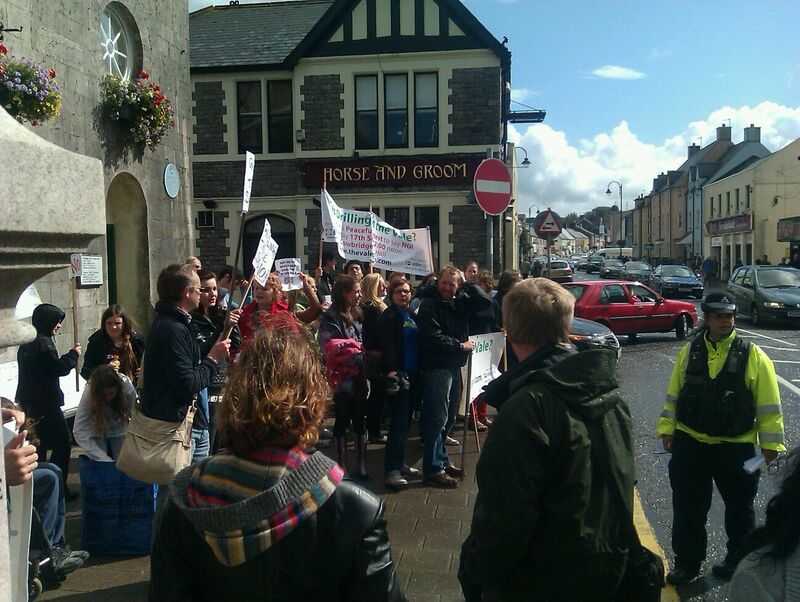 Pressure was maintained by Transition and the campaign called for a ‘peaceful protest’ to take place outside Cowbridge Town Hall on the day that the Council were holding a roadshow inside (see right). Students from a local College piled in with banners and some well rehearsed chanting. The protest headed up the High Street on a day when the town was full of Saturday shoppers. A Dogs Trust charity shop was in the middle of a celebrity opening. John Barrowan is a patron and three hundred people had turned up. They all got the benefit of the marching protesters. More awareness raised! The week of the planning decision arrived and due to the significant awareness raised the council felt it important to hold a scrutiny meeting. This gave both sides a chance to offer their reasonings for and against and resulted in some crucial questions being raised that defiantly helped to added weight to the councils final decision. The day of the planning decision arrived and following a site visit by the councillors and a screening of Gaslands, the Planning Committee sat. They had been met on their way into the building by another lively but peaceful protest. BBC and ITV were filming and interviews were given to BBC radio, national and local. Despite the electric atmosphere in the room there was a definite sense that the there was nothing else that could be done. With great relief one by one the councillors made their cases for overturning the application and in most cases a focused and passionate speech was given as to why neither test drilling or fracking should be allowed to go ahead. The decision was rubberstamped by the councils concerns over a letter sent by Welsh Water which had been voiced at the earlier Scrutiny meeting. If groundwater became polluted by drilling fluid they could not guarantee that the situation could be ‘remediated’. “Once polluted, we would be stuck with it”. By supporting the Vale Says No campaign, Transition not only helped to quickly spread the issue to a much wider audience but also broaden the argument to one that incorporated the bigger picture of long term community happiness and resilience. And it was this level-headed approach that gave the campaign a real sense of credibility and one that helped convince the local planning committee to vote unanimously against the application. So from a starting point of just one person it had very quickly become a community supported campaign that has succeeded in putting a very big spoke in the works for an industry blindly focused on finite energy extraction at any cost. 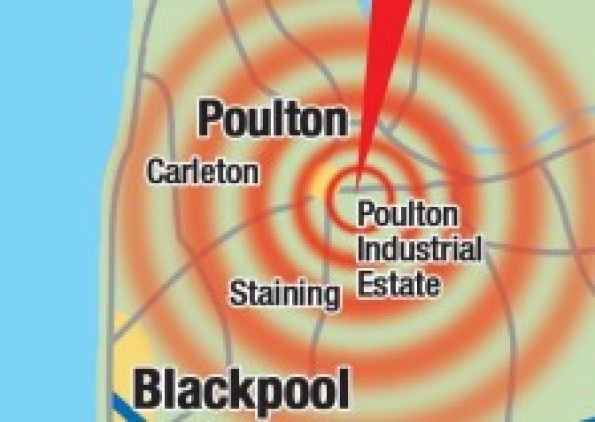 Fracking is definitely not an issue just reserved for the Vale and as has been shown in Blackpool this processes can happen all too fast and undetected if communities are not alert. And this is where Transition Towns all around the globe can play there part in not just being vigilant to fracking but continuing to do the great work they do at providing communities with a positive vision of life without the need for such unconscious acts. Having invested a lot of energy and time in the campaign you would think that our Transition projects would have suffered. However, not only have we been able to keep our other projects running well, we also have to say that our involvement has actually raised awareness of transition in the region as well as improved our track record. So now, we are looking forward to making use of the newly gained publicity and keep it coming while being able to re-channel all of our energies back into our projects. Just today we’ve received some funding for our community growing project, which will enable us to purchase more plants, signage etc. Sometimes, Transition does feel like a full time job! Firstly, I would like to say a big thank you to all those that supported us in understanding why we felt the need to take a stand against the proposed fracking. And to all those who wondered why Transition Cowbridge/Llantwit took such an active stance on something as politically sensitive as fracking this may help to offer some explanation. I think I can speak for most in the Transition Cowbridge group and say that we defiantly follow the thoughts expressed by the Transition Movement about putting energies into political activism and campaigning. As a group our focus is very much on a desire to engage as much of the community in positive acts that inform, inspire and motivate all to take steps to a life without a reliance on finite resources whist impacting positively on the environment. So why break the mould and take an active stance against fracking? For those that have carried out full and balanced research on this subject they will know that this process comes with distinctive pros and cons. However, when it comes down to science (and for most Transitioners they won’t even need to get to this they will just inherently know that this is bad and not going to solve the issue of our complete reliance on fossil fuels) offered in independent reports such as the Tyndall report http://www.tyndall.ac.uk/shalegasreport which highlights the threat to local water courses, significantly detrimental impacts on health and the long term environmental implications doing nothing was just not an option. It is also worth highlighting that the question marks that lye over the fracking process have led to definitive action being taken on a global scale. Leading to a complete ban in France, parts of Germany, South Africa and the US. there was a definitive need for swift and collective community action. Hence, we could not just sit back and see this cause lasting and irreversible damage to the local environment as well potentially significant health impacts for not just our generation but for generations long after the gas has been used up. As all Transitioners know the path that lies ahead is undoubtedly going to be rocky, but it is crucial that communities remain resilient, positive and focused on a energy decent whilst living in much greater harmony and a broader connection with our planet. So for Transition Cowbridge www.transitioncowbridge.org there is plenty more work to be done to focus on the key areas of Transition in order to build a truly resilient community for the long term. However, the positivity that comes from approaching life from this simpler and eminently more fulfilling way is something that resonates on many different levels and is doing so for more and more people throughout the community. Council vote unanimously against application! As you’ve probably heard by now – the Vale’s anti-fracking campaign set a milestone yesterday. We were delighted when the Vale planning committee unanimously objected to the planning application to test drill for Shale Gas in Llandow! It wouldn’t have happened without the team effort of various local groups: mainly The Vale Says no but also the support of Transition Cowbridge, Transition Llantwit, The Green Party, Cowbridge Hub, Cowbridge and Llanblethian Residence Group and others. All were present on Monday at the Vale council’s scrutiny meeting on fracking and helped to convince the councillors and Welsh Water that the process is highly risky and not something we want to see anywhere in the Vale, Wales and beyond. Most councillors in the meeting last night were very vocal in their opposition to the application. A wide range of concerns were raised with a strong underlying wish to protect future generations from possible catastrophic consequences of this process. A late letter from Welsh Water stating that they were concerned about ‘risks of water contamination’ gave the council specific reasons that back their rejection. This decision follows the Vale Council’s scrutiny committee’s vote to address the Welsh Government and call for a moratorium. One of our own members, Michaela, was interviewed on BBC Wales Radio Evening News. You can listen to the recording here: http://www.bbc.co.uk/programmes/b0161b6y It’s toward the end of the show (1:30h). However, it is not over yet as the surprised Coastal Oil and Gas have expressed that they plan to appeal to the Welsh Assembly and it will most likely come to a public enquiry. Now our council needs us to stand behind them and their decision, so please keep the support coming! For now, however, it is time to put the dancing shoes on and celebrate at tomorrow night’s Ceilidh in Cowbridge Town Hall. It’s a Fairtrade event led by the Thingumijigs Ceilidh Band and starts at 7pm. Tickets are £5 (£2 for children) and are available from Davies Newsagents and the Little Shop of Calm (or on the door, subject to availability). We hope to see you there for a celebratory dance! Well done everyone and thank you so much for your support! As you see, it pays off! Futher NEWS EARTHQUAKES in Blackpool could lead to a review of policies controlling a controversial gas extraction technique in Wales, First Minister Carwyn Jones has suggested. you can all attend and should be able to voice your concerns to the councillors. This is the D day for the application to test drill for shale gas. We need a really big presence to let Coastal Oil & Gas know how much the Vale objects to Fracking. There will be press there on the day so it will give everyone a chance to air their thoughts on the result. PLEASE COME ON DOWN WITH BANNERS IN HAND FOR A LOUD BUT PEACFUL PROTEST! The opposition, meetings, protests and awareness raising is defiantly having an effect and we’re very happy to announce that the decision about the planning application has been deferred to a site visit. This means that we have got another month to gather even more momentum – and we’re sure that Louise will organise a protest on site for that day. 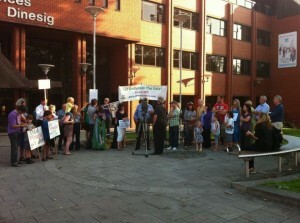 Transition teams up with the Vale Says No campaign to host public meeting. Transition Cowbridge and the Vale Says No campaign has organised a public meeting in Cowbridge. The meeting will take place at 7.30 on Wednesday 7th September in the Town Hall and will be used to give an update of the current planning application. There will also be a showing of a feature length documentary that offers an insight into the potential impacts that arise from the drilling process as well as a chance for questions and answers. Invitation letters have been sent to all local and Vale councillors. Alan Cairns MP and Jane Hutt, AM, have been invited to speak, both of whom are campaigning against the planning application. Please support by attending the meeting. If you can’t and you want to appose this then letters of objection need to go to the Vale Council by the 29th of September. Following the re-emergence of the planning application by Coastal Oil and Gas to drill and test for the presence of shale gas in Llandow, Transition Cowbridge and the Vale Says No campaign has organised a public meeting in Cowbridge. The meeting will take place at 7.30 on Wednesday 7th September in the Town Hall and will be used to give an update of the current planning application. There will also be a showing of a feature length documentary that offers an insight into the potential impacts that arise from the drilling process as well as a chance for questions and answers. “We feel that it is vitally important that all local residents be made aware of the significant impacts this will have to the Vale as a whole and the potential risk to human health and to the environment. “We strongly support the move to impose a moratorium on shale gas extraction which has been called by environmental groups and geology experts in the field at least until the results of studies into the methods have been properly evaluated. Such moratoria are already in place in parts ofGermany, theUSA. A complete ban has been imposed inFrance. “We are also aware of the proposed benefits put forward by Coastal Oil & Gas and feel strongly that these are significantly outweighed by the negative impacts that will result from the drilling”.